Are you an adult looking for an Igbo language tutor to help you meet your Igbo goals? Then I am here to help you find a teacher! 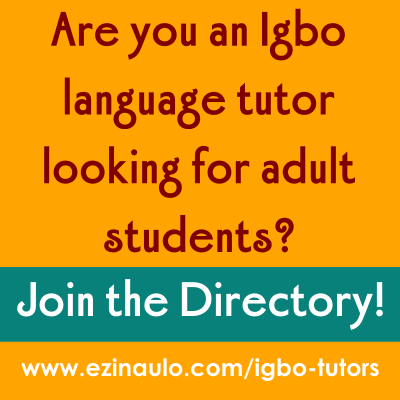 Use the Igbo Language Tutor for Adults Directory below! Many tutors offer both online and offline Igbo tutoring services for students in Nigeria, United States, UK, Canada, and all over the world internationally and you can meet with them to learn Igbo at your own convenience. About AC: I was born and raised in Igbo land in former Eastern Nigeria (now Imo State). I attended both my elementary and secondary school in Igbo land. Igbo is my native language and I am fluent in reading, writing & speaking in Igbo language. I grew up among the elders and titled men and was raised in Igbo cultures and tradition. I have excellent knowledge of Igbo history, culture, proverbs, storytelling and Igbo spirituality and beliefs. I am an author of two Igbo story books. I am also an Igbo Traditional Titled Chief. So I can teach you a lot about Igbo language from my weight of experience. 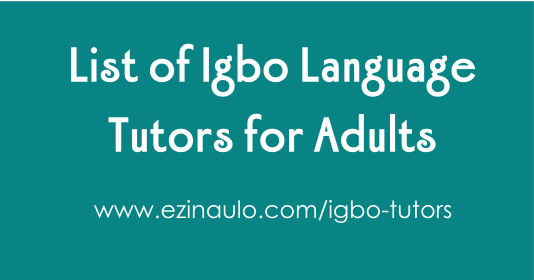 Are you an Igbo Language Tutor that loves to work one on one with adult learners and want to advertise your services on this directory? Then click here to apply and learn more about how you can get in front of your dream students with help from Ezinaụlọ! Note: This page may contain affiliate links at no extra cost to you. © Copyright Ezinaulo Igbo Language Services LLC 2017-2019. Beginner Igbo Lessons.Shop.Advertise.Join my Igbo Study Group.